The Snap Track system contains multiple accessories, both common and unique, to transition, guide, and protect cables. 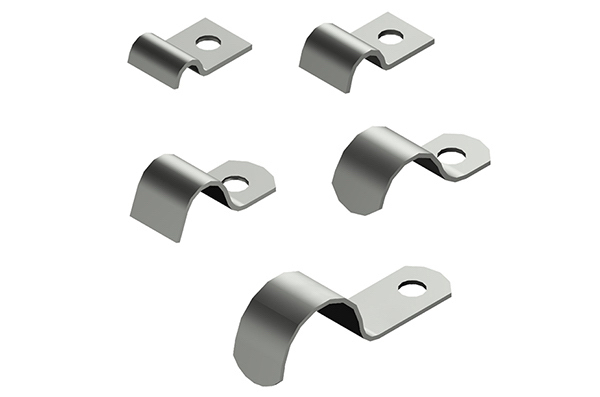 We offer Wire and Cable Clamps, Junction Panels, in addition to Snap Track Wire Spools and Mounting Brackets, designed to eliminate “pig tails” that commonly occur at the instrument connection. We also provide Cable Ties and Snap Track Grommets. Snap Track single cable clamps are designed to securely fasten a single cable to the cable tray. • Connects directly to the Snap Track tray with standard ss bolt, nut & washer. See Fasteners for selection. • Manufactured from 316SS and designed to secure the single cable only. TechLine Mfg. recommends cables be fastened every 18 in. (450 mm) with Snap Track cable clamps on all vertical runs. Although not required by NEC, cables should also be fastened every 3 ft. (1M) on horizontal runs to maintain spacing and prevent movement due to fault current magnetic forces. ** NOTE: Clamp mounting holes allow for standard 1/4” fasteners.